As my contribution to this year’s World Listening Day, here are three recordings of a fence I made at a Sandwell Valley Country Park just North of Birmingham. This is an ongoing study of the park which, due to its proximity to both the M5 and M6 motorways, does not afford very good air recording opportunities. Instead I have been focussing on contact mic and hydrophone recordings. In the first one the microphones are attached to the smooth top wire and you can hear the low singing drone of the wind blowing across the wire. The higher frequency taps and scrapes are the sounds of the long grass moving against the fence. 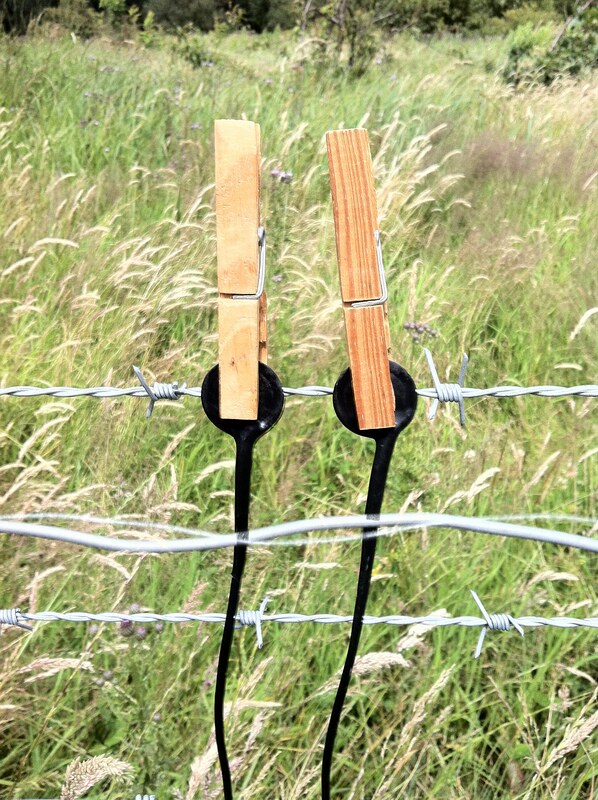 In the second example the microphones were attached to the top barbed wire as I struck and plucked the smooth wire in front (as in the photograph). I assume the vibrations were being transfered via the wooden fence posts to which they were both attached. There are some very low frequencies in these sounds that will be better appreciated on headphones or loudspeakers with a wide frequency range. Finally, in the third example, I moved the microphones onto the top of the wire grid formation that forms the main fence structure, this gives a much stronger impression of the grass moving against the fence. All the recordings were made with contact microphones by Jez Riley French. I have recently been enjoying the sight of a pair of nesting robins (Erithacus rubecula) who chose to build their nest amongst the ivy and honeysuckle on a fence directly outside my studio. The glass panelled door and position of my desk meant that the dutiful feeding trips of the male returning to the sitting female frequently caught my eye. I eagerly awaited the hatching of the chicks as their nesting position was conveniently situated for me to gain easy access with my microphones. A week or so later the increased frequency of the parents darting in and out of the nest, accompanied by a distinct, high pitched chattering sound on each visit signalled my time for action. Using a pair of small, lightweight omnidirectional microphones I was able to clip these to the shrubbery just outside the entrance to the nest. This recording captures the sound of the adult birds’ wings as they enter the nest, the excited chattering of the babies as they call out to be fed followed by some satisfied chirps. In this particular excerpt the background ambiance reveals the urban location, the slightly inclement weather and the unexpected, mid-week peal of bells from the local church. While the position of the nest, barely 1.5m up the fence, was ideal for my field recording pleasure, since their arrival I had been concerned about the security of this location. There are neighbourhood cats that also appear at my window. Inevitably, after only a few precious days of life the robins were conspicuous by their absence and a quick look revealed one of the chicks, floating lifeless in a bucket of rainwater by the back door. Life is harsh in the urban jungle. So this turn of events lends a particular poignancy to this recording. This recording contrasts ‘Below the River Wye’, being made in a small, thin stretch of woodland running along the bank above the river. The wood was flanked by fields and so, in it’s isolation, was accommodating a relatively concentrated number of birds. The microphone was set at ground level, well placed to capture the sounds of flies and other insects which are also prominent. The flowing river is omnipresent and the soundscape as rich and dense as that below the water. 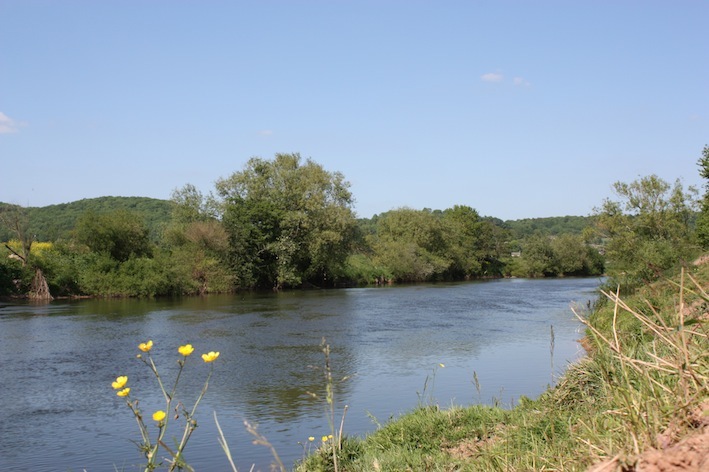 The first of two recordings that contrast the soundscape of the River Wye above and below the water line. 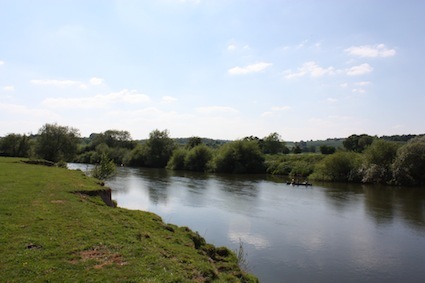 Recorded on a glorious day in early June, where the Wye river runs past the small village of Fownhope, just south of Hereford, UK. The banks of the river are steep at this point, and the water surface considerably lower, however I managed to descend to a small stretch where a conveniently placed log allowed me just enough access to submerge the microphones. 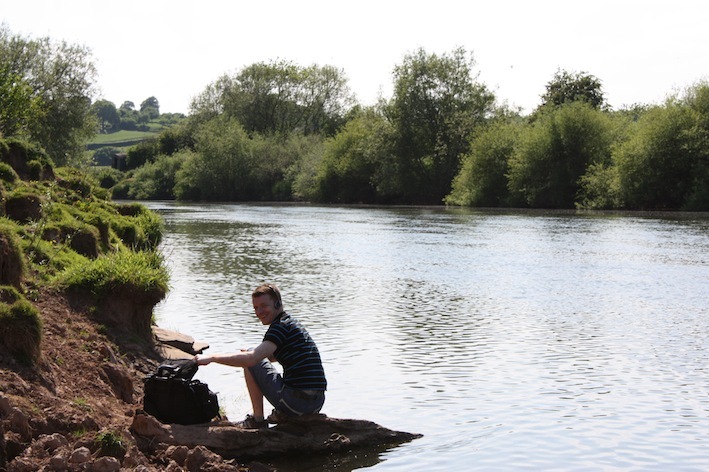 This hydrophone recording demonstrates the richness of the soundscape underneath the water. I’m frequently surprised by the density of sounds created by aquatic life, this particular example reminds me of the rhythmic songs of cicadas. I added a small pond to my garden at the beginning of the summer last year, one of the moulded PVC ones. I potted up some marginals, dropped in some oxegenating plants and took delivery of some tadpoles from a friend. By the end of July, nature had worked her magic as wildlife had begun to establish itself. I made this recording using hydrophones from Jez Riley French. I can recommend his products (I have some of his contact mics too), they’re well made, competitively priced and produce great results. I have the ‘basic’ models but understand he has since improved the design with his ‘C’ series. This recording features with other field recordings and processed material in a live laptop set I performed last year. A couple of the frogs survived to return and spawn in the pond this year. It looks like the tadpoles have begun to hatch. I’ll be making some more recordings in the coming months. I will be playing with Antti Saario as Anvil & Stirrup at two events in the coming months. The first gig is at Falmouth’s School of Noises on Thursday 19th January at the Jacob’s Ladder Inn where we’ll playing a live laptop set and a live electronics improv with double bass player Thanos Polymeneas who’s also performing on the night. 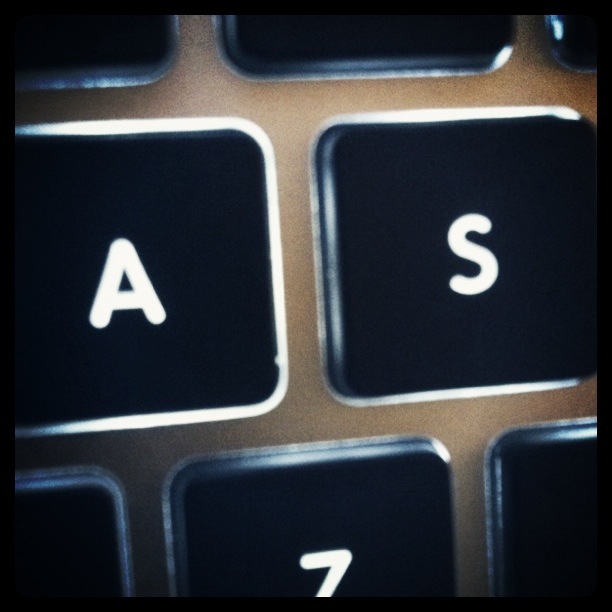 The second is Audiograft 2012, Oxford’s festival of sound art and experimental music. We’ll be playing a live laptop set at the Jaqueline Du Pré Concert Hall on 2nd March at 7.30pm. Also on the bill is our friend and ex BEAST composer David Prior and the fantastic Trevor Wishart. The Audiograft festival runs from Monday 27th February to Sunday 4th March and includes sound installations and performances from the likes of Lee Patterson and Robert Curgenven, ParkinsonSaunders, Paul Whitty, Max Eastley, Jason Kahn and Patrick Farmer. Sunday 18th July 2011 was World Listening Day, an international call to spend some time listening to your soundscape on the anniversary of R. Murray Schaefer‘s birthday. Schaefer defined the concept of the ‘soundscape’ in his book Soundscape: Our sonic environment and the tuning of the world and helped establish the World Soundscape Project both significant in the formation of the area of study now known as Acoustic Ecology. I wanted to participate in World Listening Day but it was raining in Birmingham. So I listened to the rain for some time and recorded the sound it made falling on the plastic rubbish bins outside my kitchen window. I used contact mics taped to the underside of the bin lids. It was the first time I had recorded anything in a while. It was nice to engage with sound again in such a focused way, to spend time enjoying the pleasure of simply listening. I listened for quite a long time but you can listen to some short excerpts if you like. 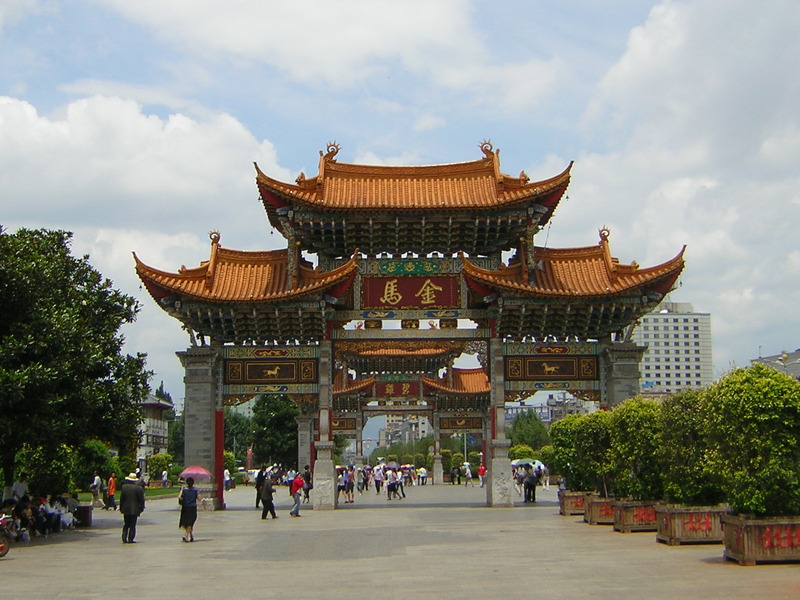 This recording was made during a brief visit to Kunming, capital of Yunnan Province, China. I stumbled upon a small market with some caged birds just off one of the main central shopping areas. However this is not the large flower and bird market recommended in the travel guides. 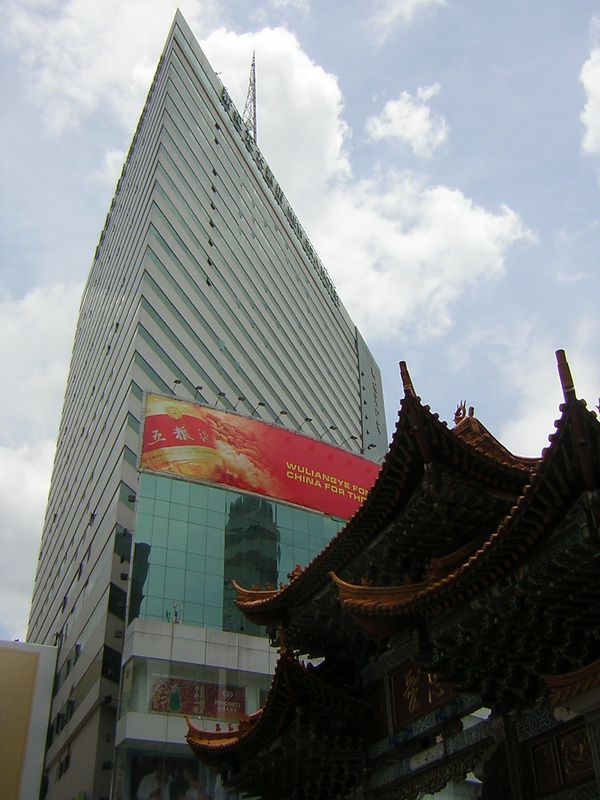 Kunming is a fine example of the modernization and development happening in many Chinese cities. You can still find occasional remenants of the old city jostling against the shiny high rises and contemporary city landscaping.